New York Times bestselling author Marie Bostwick crafts a timeless tale of friendship, love, and the choices we must make in their name. . . While New Bern, Connecticut, lies under a blanket of snow, the Cobbled Court Quilt Shop remains a cozy haven for its owner, Evelyn Dixon, and her friends. Evelyn relishes winter's slower pace--besides, internet sales are hopping, thanks to her son Garrett's efforts. In addition to helping out at the shop, Garrett has also been patiently waiting for his girlfriend, Liza, to finish art school in New York City. But as much as Evelyn loves Liza, she wonders if it's a good idea for her son to be so serious, so soon, with a young woman who's just getting ready to spread her wings. . .
Liza's wondering the same thing--especially after Garrett rolls out the red carpet for a super-romantic New Year's Eve--complete with marriage proposal. Garrett's the closest thing to perfect she's ever known, but what about her own imperfections? The only happy marriage Liza's ever seen is her Aunt Abigail's, and it took her decades to tie the knot. Soon, Liza is not only struggling with her own fears, but with the mixed reactions of her friends and family. And when she finds herself torn between a rare career opportunity and her love for Garrett, Liza must grasp at the thinnest of threads--and pray it holds. . .
Marie Bostwick Skinner was born and raised in the northwest. In the three decades since her marriage, Marie and her family have moved frequently, living in eight different states at eighteen different addresses, three of them in Texas. These experiences have given Marie a unique perspective that enables her to write about people from all walks of life and corners of the country with insight and authenticity. Marie currently resides in Connecticut where she enjoys writing, spending time with family, helping out at church, gardening, collecting fabric, and stitching quilts. Visit her at www.mariebostwick.com. 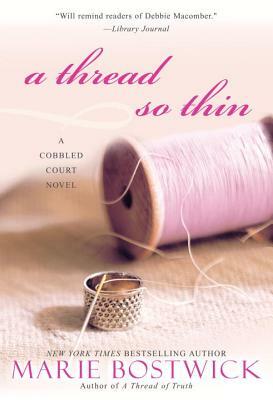 In Marie Bostwick’s novel, A Single Thread, Evelyn Dixon is a Texas housewife, who in a matter of days must not only vacate her marriage but also her home. If the circumstances of life called for you to leave your home and move quickly, where would you go? How would you cope? What would scare you about the situation? What would excite you? A quilter of more than 25 years, Evelyn likes the exacting precision her hobby requires. But she also revels in the fact that if 100 people were to quilt the same pattern no two of their quilts would be exactly alike. What do we know about Evelyn because she is a quilter? How would you elaborate on her view of quilting as a metaphor for life? After only a few hours in New Bern, Evelyn realizes she feels more at ease in the New England town than she ever did in her planned suburban development. Do you believe certain places can speak to us? Can you recall a place where you immediately felt at home? Do you know why? When Evelyn ventures into the old brick storefront that will become Cobbled Court Quilts, she doesn’t really see the grime or the broken windows or the water stains on the walls. Instead, she envisions how the tiny window panes would gleam if washed and how inviting the front door would be with fresh red paint. What allows some people, like Evelyn, to see the possibilities in life—and not be overwhelmed by the negatives? Is there danger in having such a world view? Can you remember one time when you saw potential in something (or someone) that no one else did? If you took action on your feeling, what happened? Newly divorced, financially fragile, and of an age when some would say she should be sitting on a Florida beach worrying about her grandkids, what possesses Evelyn instead to open a quilting shop—in a new town no less? Is she brave? Foolhardy? Is there something you’ve always wanted to do or try? Would the people in your life cheer you on? Or brand you delusional? Is it ever too late to pursue your dream? Abigail Burgess-Wynne, the matriarch of New Bern, appears to be popular, pragmatic, and in total control of her life. If she were not a wealthy woman, willing to support many local causes, do you think she would be as popular? Is her popularity only a factor of what she (and her money) can do for others? What could possibly make her so resistant to her niece’s cry for help? What do we risk when we pin someone else’s sins on another? Why does it take Evelyn so long to realize that Charlie Donnelly is smitten with her? Do you think the challenges to her health had anything to do with her lack of awareness of his feelings? Have you ever been unaware of someone’s feelings for you, and what did you do when you finally realized those feelings? When Charlie makes his duck confit and Evelyn hosts her quilting classes, some would say they are just “trying to make a living.” But as Charlie tells Evelyn, there are about 200 easier ways to do that. Pushed, Evelyn admits she dreamed that her store would spawn a community of quilters. Where do you find community in your life? What do we gain through community? Three of the scariest words in the world: You have cancer. After Evelyn hears them, she breaks down not with friends but before three strangers. Why? What is the most unusual situation in your life from which you ultimately made a friend? If you have had cancer or have known someone battling cancer, what did the experience teach you? What would you share about this six-letter word? Abigail may appear chilly, materialistic, and controlling, but Evelyn believes the brittle shell houses a compassionate soul. In fact, she believes the same holds true for the rebellious and prickly Liza Burgess. What would cause Abigail and Liza to hide—even deny—such a positive quality about themselves? Have you ever put up walls in your life, then rued the decision? Too often we believe we are loved for our breasts or our muscles, our looks or our hair, when ideally we all want to be loved for the cocktail of qualities that makes us, well, us. What are your perennial, unchanging qualities—both good and bad, quirky and mundane, silly and serious? Life doesn’t promise that we will always be happy, but Evelyn manages to piece together what she needs to face the journey: a group of loyal friends. Name three things that would help you through the ups and downs of life.